The McFaddin-Ward House was built in 1905-06 in the striking and distinctive Beaux-Arts Colonial style. The structure and its furnishings reflect the lifestyle of the prominent family who lived in the house for seventy-five years. When W. P. H. and Ida Caldwell McFaddin moved their young family, two sons and one daughter, into their house in 1907, Beaumont was still enjoying the economic effects of the discovery of oil at nearby Spindletop in 1901. Having already accumulated considerable wealth from the cattle business, rice farming and milling, commercial real estate, and trapping, the family prospered even more after Spindletop, since Mr. McFaddin owned part interest in the land where oil was discovered. 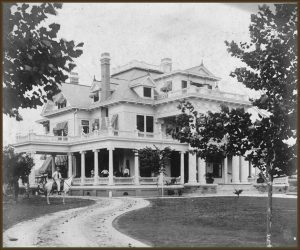 The McFaddin home was one of a number of grand residences built in town by local architect Henry Conrad Mauer during the early twentieth century. Mauer, trained at the Pratt Institute in Brooklyn, New York, incorporated local materials with the most advanced electrical, heating, and plumbing systems of the time. The home was initially built for Colonel W. C. Averill and his wife Di, the sister of W. P. H. McFaddin. After living in the house for several months, the Averills decided to trade houses with the McFaddins, who lived nearby. In early January 1907, the McFaddins moved in. The house served as a lavish backdrop for the frequent entertainments and elegant parties the McFaddins hosted. In 1919, the McFaddins’ daughter Mamie married Carroll Ward, and the couple moved into this house with her parents. They lived their entire lives there, making few changes to the house or its décor after 1950. Throughout much of Mamie McFaddin’s adult life, she kept a diary documenting social events, consumer habits, and daily routines, with mentions of noteworthy family events and happenings around Beaumont, in the region, and the world. The family were excellent record-keepers, holding on to photographs, invoices, receipts, and other financial documents. Because of their foresight, we are able to paint a picture of what life was like for a wealthy Southeast Texas family. 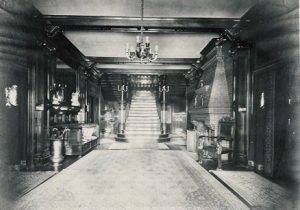 Today, visitors to the house receive guided tours of three lavishly furnished floors in the home. Trained guides combine family stories and local history with information about the house and its furnishings to tell the story of the McFaddin family and the era from the early 1900s through 1950.